Home care, also known as daily activity assistance, is where we assist seniors in managing their everyday life. 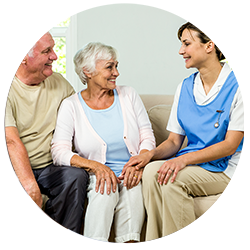 Home care allows your loved one to remain at home and carry on with their daily life with the assistance of an Amicable caregiver. Our caregivers help your loved one continue living life at home in a safe and fulfilling manner. Amicable’s caregivers are the finest in the industry. They have met our rigorous criteria, background checks, and they complete ongoing education to stay in the know with industry standards and best practices. Our staff’s utmost concern is the well-being of our clients, which they treat with respect and as the client wishes to be treated. Our caregivers maintain the highest ethical standards and deliver sincere “care form the heart” for every client in the comfort of their home. Read our In-Home Care FAQ’s here. 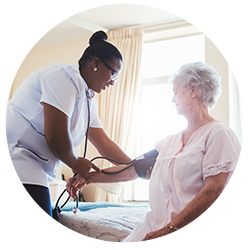 Amicable Healthcare is a trusted, licensed staffing agency and provider of the finest in-home-caregivers and medical personnel in the industry. We assist with recruitment, screening, reference and criminal background checks of potential caregivers for a nominal one-time fee. 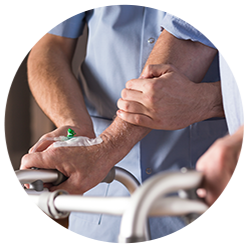 Our placement services also extend to private individuals that desire to hire their own home care aides. Amicable Healthcare is licensed by the Washington State Department of Health to provide facility and in-home placement services. We are presently contracted with the City of Seattle Human Services Department Aging and Disability Services (ADS), Washington State Department of Social and Health Services (DSHS), Department of Developmental Disability services (DDD), and the Asian Counseling and Referral services of Seattle (ACRS) to provide home care and Home Health services for elders and disabled people who are unable to carry out certain routine activities of daily life in the King and Pierce county areas. Amicable is the trusted agency for the finest in-home-caregivers and healthcare professionals in the industry, providing excellent career and growth opportunities, comprehensive benefits, and flexible scheduling. Our skilled staff will work with you to find the job opportunities that match your unique skills and work experience. We also offer ongoing education and training, to keep you up-to-date on the latest industry information, trends, and best practices. We currently work with 600 clients and employ 700 care providers in Western Washington, and we are always hiring. View our career opportunities and apply online today! We are so pleased with our caregiver. She is careful, consistent, reliable, motivated, caring, and kind. She is more than we hoped for. I trust her completely and feel that she is part if our family. We feel so fortunate and hope she wants to stay with us forever. Thank you, Amicable Healthcare! Please allow me to express my deep appreciation for your organization. You are to be commended for your professionalism. Whenever a problem transpires, the agency is quick to resolve the issue. I feel that they are truly concerned about me as an individual, and I never feel like I am merely a number. I would like to express my appreciation with this company for the past five years. Please continue the great work. Thanks for everything. Communication is key to a good relationship with clients and employers. I have worked for Amicable Healthcare for six months. Whenever I have a question, it is promptly answered. The staff seems to really be there for me, and I haven’t had any complaints thus far. Keep up the good work, Amicable! Amicable Healthcare has been my provider for over 10 years. Since I have been working with Amicable, I have been very pleased with their oversight and care for me. My current program supervisor comes out and checks on me routinely, and I feel very connected to my provider. For anyone considering an organization to help with all their home care needs and personal care, I would definitely recommend Amicable. I have worked in healthcare for many years. Amicable Healthcare offers a solid caregiving future with professional oversight and direction. The office staff is knowledgeable and helpful…I heartily recommend Amicable Healthcare if you are interested in either a part-time or a full-time career in caregiving. We would love to discuss your needs with you and how our services can be tailored for your individual requirements.